is a researcher at Extreme Life Isyensya in Gentbrugge, Belgium. His research interests include zoology, developmental biology and anatomy. is an associate research scholar and lecturer in the department of geosciences at Princeton University. Her research interests include biology, ecology and microbiology. The living landscape all around us is just a thin veneer atop the vast, little-understood bulk of the Earth’s interior. A widespread misconception about the deep subsurface is that this realm consists of a continuous mass of uniform compressed solid rock. Few are aware that this mass of rock is heavily fractured, and water runs in many of these fractures and faults, down to depths of many kilometres. The deep Earth supports an entire biosphere, largely cut off from the surface world, and is still only beginning to be explored and understood. The amount of water in the subsurface is considerable. Globally, the freshwater reservoir in the subsurface is estimated to be up to 100 times as great as all the available fresh water in the rivers, lakes and swamps combined. This water, ranging in ages from seven years to 2 billion years, is being intensely studied by researchers because it defines the location and scope of deep life. We know now that the deep terrestrial subsurface is home to one quintillion simple (prokaryotic) cells. That is two to 20 times as many cells as live in all the open ocean. By some estimates, the deep biosphere could contain up to one third of Earth’s entire biomass. To comprehend the deep biosphere, we must look past the familiar rules of biology. On the surface, life without the Sun for an extended period of time is dangerous or deadly. Without daylight, no plants or crops can grow. Temperatures get colder and colder. Few organisms, including human beings, can long tolerate such conditions. For instance, people living within the Arctic Circle – as well as the maintenance staff at Antarctic research stations during winter – experience 24-hour darkness for several months each year. They are more vulnerable to health issues such as depression. They find ways to adapt and get through the long, dark, cold winter, but it isn’t easy. Now imagine the challenges in places that have been isolated from sunlight and organic compounds derived from light-dependent reactions for millions or even billions of years. It seems incomprehensible that anything could survive there. Yet scientists, including the members of our team at Princeton University in New Jersey, have found surprisingly diverse microorganisms in the deep Earth, adapted to a lifestyle independent of the Sun. Sunlight can filter down to depths of about 1,000 metres in ocean water, but light penetrates no more than a few centimetres into soils or rocks. Cold is not a problem down there, however. Quite the opposite: rainwater that percolates kilometres deep into the crust along fractures and faults between rocks can reach temperatures of 60°C (140°F) or higher. The further down you go from the surface, the closer you are to the mantle. Heat rising from the inner Earth is what warms the fissure water. Additionally, the water is under high pressure, contains very little or no oxygen, and is bombarded by radiation from natural radioactive elements in the rocks. Within this hellish environment, though, are crucial ingredients for nurturing life. Underground water reacts with minerals in the continental crust, and the longer the water has been trapped down there, the more time there has been for the results of those reactions to accumulate along the flow path. The slow reactions between water and rock dissolve minerals into the water, and break up some of the water molecules, producing molecular hydrogen. This hydrogen is an important fuel for microorganisms in the deep subsurface. We are also beginning to map the different ecosystems and populations of the deep Earth. Generally speaking, the older subterranean fissure water is brinier (saltier) and has higher concentrations of dissolved hydrogen. Our studies and those by some of our colleagues have shown an apparent trend that the microbes living in older, more brackish water are distinctly different from ones in the younger, less saline water. Old-water ecosystems are dominated by hydrogen-utilising microorganisms such as sulphate-reducing bacteria and methane-producing archaea. Those methane-producing archaea, or methanogens, are microbes that visually resemble bacteria but are so structurally and genetically distinct that they belong to a completely separate domain of life. Sulfate-reducing bacteria and methanogens are among the life forms that appeared earlier in the evolutionary history. In contrast, young-water ecosystems are dominated by metabolically diverse and versatile bacteria of the phylum proteobacteria. Studies of the deep ecosystem are already resonating across many fields of science. They are sparking new ideas about the origin of life and about the limits of metabolism. They are filling in new details about the cycling, distribution and storage of carbon on Earth. Deep continental ecosystems will aid the search for underground life on rocky planets such as Mars; deep-sea and sub-seafloor ecosystems, in turn, will help researchers assess the likelihood and possible nature of organisms living on the ocean moons Europa and Enceladus. The implications of this research are truly cosmic in scope. Subsurface microorganisms are estimated to be extraordinarily long-lived. In our studies, they show a turnover time as slow as 1,000 years, meaning that they divide only once every few thousand years. To put it in perspective, the common gut bacterium E.coli divides once every 20 minutes. One of the long-standing questions is, how do the deep microbes achieve such a slow-motion lifestyle? It is not easy to make a living in the subsurface because the biochemical reactions to harness energy from minerals and geological gases – a set of processes known as chemotrophy – are not as efficient as photosynthesis, the process that green plants use to capture energy from photons of sunlight on the surface. Some subsurface microorganisms can form stress-resistant spores and remain inactive in order to withstand extreme subsurface conditions; otherwise, microorganisms have to invest at least a certain amount of energy, which varies from one taxa (evolutionary population) to another, to maintain the integrity and functionality of the cells. Nowadays, genetic sequencing techniques allow us to investigate in great detail which organism has the potential to metabolise what component of the environment. We can also probe the metabolic potential of the community as a whole using metagenomics, a way to study the collective genetic diversity. Together, these approaches are revealing the overall structure and functioning of the deep biome. Our studies of the proteobacteria-dominated communities (collected from several sites 1 to 3 km below land surface) show that they share a high degree of similarity with each other, as determined by a genetic marker known as the 16S ribosomal RNA. However, the same functional traits are carried out by different taxa. This variation cannot be explained by physical separation of the sites, nor by each location’s unique physico-chemical features – normally the most ecologically influential factors for such segregation. Neither depth nor water-residence time appear to be a significant contributor to differences, either. Future investigations on the origins of subsurface microorganisms, along with their evolution and movement over the geological history, will aid our understanding of the biogeography, or living landscape, of the subsurface. We recently completed a study of subsurface microbes using high-throughput sequencing to look at the total population of RNA and proteins. In a 2015 paper, we described for the first time the comprehensive network of metabolic functions being actively executed in the subsurface. At 1.3 km below land surface at the Beatrix gold mine in South Africa, the active community was comprised of 39 phyla from all three domains of life: bacteria, archaea and eukarya – the domain of complex organisms that include humans. Overall, the ecosystem was dominated by proteobacteria. The molecular data, together with isotope geochemistry and thermodynamic modelling, presented a unified story that the most successful group down there is the betaproteobacteria, a class of proteobacteria that obtain energy through a coupling of nitrate reduction and sulphur oxidation in order to fix carbon dioxide for cellular growth. The demand for nitrate among deep microbes was unexpected; it had gone unnoticed prior to our study because the measured nitrate concentrations in the subsurface water samples were tiny. More interesting, we deduce that deep microbial groups have established strong, paired metabolic partnerships, or syntrophic relationships, which helps the organisms overcome the challenges of extracting the limited energy that originated from rocks. Rather than competing directly with each other, these microbes establish a win-win collaboration. Scanning electron microscope image of some of the eukarya recovered from two different mines. (a) Dochmiotrema sp. (Platyhelminthes), (b) A. hemprichi (Annelida), (c) Mylonchulus brachyurus (Nematoda), (d) Amphiascoides? (Arthropoda). Scale bar, 50 μm (a,b), 100 μm (c), 20 μm (d). Most of the carbon in microbial cells appears to be derived directly and indirectly from methane. This is true even though methanogens and methane-oxidising microorganisms together accounted for less than 1 per cent of the organisms in our samples – an astonishingly low fraction, given that methane was the most abundant dissolved gas (~80 per cent) in the water samples we studied. The different kinds of microbial taxa that recycle methane in the subsurface occur at varying abundance over time and space. Despite the advantages of metabolic partnerships, some deep microbes have evolved to go it alone. Through metagenomics and genome-based analysis, the research scientist Dylan Chivian of Lawrence Berkeley National Laboratory (building on work by Tullis Onstott, the head of our team at Princeton University) discovered a sulphate-reducing bacterium, Candidatus Desulforudis audaxviator, that has complete self-reliance for living in the subsurface ecosystem. Since the publishing of this discovery in 2008, Ca. Desulforudis has been detected elsewhere in both continental and marine subsurface. Single-cell genomic data suggests that ancient viral infections transported archaea genes into Ca. Desulforudis cells, which gave the bacterium the genetic machinery for its self-reliance. Single-cell genomic data has not only permitted us to investigate cell-to-cell variations in the genomic materials of subsurface microbes, but also to recover the genomic blueprints of microbes that cannot be cultivated. These overlooked organisms are sometimes called ‘microbial dark matter’ because they evade detection by conventional laboratory methods. As with astronomical dark matter, microbial dark matter vastly exceeds the amount that is ‘visible’ to us. Some 99 per cent of the microorganisms do not grow under artificial laboratory conditions. We must rely on single-cell genomics and metagenomics to hunt for microbial dark matter in the deep subsurface. Even after we and several other research teams realised that bacteria and viruses have colonised the harsh, deep subsurface, most scientists still considered it unlikely that anything more complex than these unicellular organisms would be able to survive down there. More complex, multicellular organisms generally cope less well with low oxygen levels and high pressure, and they require more food. All the same, in 2006 our group (led by Onstott and Gaetan Borgonie) started to look for nematodes at great depths. Nematodes (commonly called roundworms, not to be confused with earthworms, which belong to a group all of their own, the Annelida) are extremely common multicellular organisms. Together with insects, they are the most dominant animals on the planet. Nematodes are mostly very small. Although some can range up to several metres in length, most are less than 1 mm long. Their origin extends back 1.1 billion years, to a time not long after the divergence of plants and animals in evolution. Nematodes are considered to be among the oldest multicellular organisms still known on the planet. They have conquered almost any niche on the planet from soil to oceans; some have even evolved to parasitise plants and animals, including humans. What made nematodes a logical choice to look for in the deep subsurface is their proven track record for being able to survive in extreme environments. Many species are able to alter their life cycle when confronted with life-threatening conditions. They form a survival stage in which their metabolism is greatly reduced. In this way, they are able to withstand anoxia, heat, drought, freezing and toxic conditions for several decades, and then revive when wetted or when conditions are adequate again. Nematodes can withstand huge pressures, too. When the Space Shuttle Columbia broke up during re-entry in 2003, a biological experiment on board containing nematodes made a free fall from an altitude as high as 42 km. Their canister hit the ground with a force of roughly 2,500 g. (Transient centrifugation at up to 10,000 gs, which would liquefy a human, is a common manipulation in standard nematode laboratory procedures.) A few weeks later, the experiment was recovered. The nematodes inside the canister had not only survived the ordeal, they were reproducing. Furthermore, humans need 21 per cent oxygen in our atmosphere to be able to breathe. Nematodes can make do indefinitely with only 0.5 per cent oxygen, and many species can survive extended periods with less or no oxygen at all. 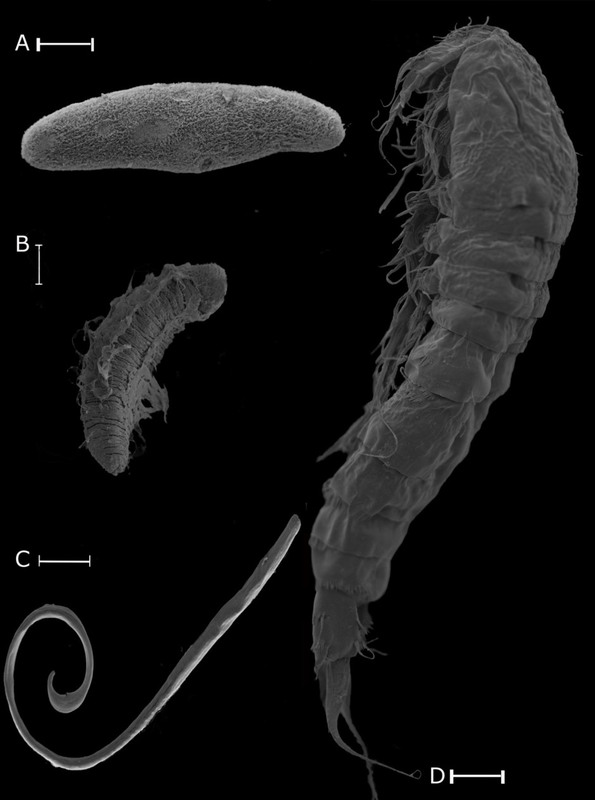 Our search for deep-Earth nematodes resulted in the 2011 discovery of a new species of nematode, Halicephalobus mephisto. Its name literally means ‘the devil worm’. The nematode was recovered from water that flowed out of a fissure at a depth of about 1.3 km in the Beatrix gold mine. Carbon-dating showed the water there to be around 3,000 years old. In the years that followed, we found more nematodes living at an even more remarkable depth of 3.8 km. After the discovery of the devil-worm nematode, we performed a long filtration sampling setup that lasted two years. During that time, we filtered 12,845,647 litres of water at a depth of 1.4 km. (The search for deep life is painstaking work!) This effort resulted in the discovery of a whole zoo of invertebrates in water that was 12,300 years old. We recovered species of flatworms, nematodes, rotifers, arthropods, annelids, fungi and protozoa, a whole community thriving inside the filter. Genetic analysis revealed that none of these was a new species, but that they were all species already known from the surface. Further investigation revealed that nearly all the complex subsurface dwellers shared a common characteristic: they were known to be cosmopolitan, and therefore well-suited to living in extreme environments. At that time, we also made the first video footage of a biofilm – a thin, self-contained living layer – attached to crevices deep inside the rock. The biofilm is composed of bacteria and organic matrix, and it is home to all these animals. We also found several non-animal species, such as fungi and protozoa, living in deep fissure water that ranged in ages from 7,000 to 500,000 years old. Often their abundance in the fissure water was low, just one specimen per 10,000 litres. In contrast, in certain areas we found patches of bacterial biofilm containing worms at population densities of more than 1,000,000 individuals per square metre. Because the known subsurface animals are small, a cavity the size of your thumb can hold an entire ecosystem containing several hundred small invertebrates, fungi and protozoa. The commonality of species on the surface and subsurface posed a consistent research challenge. At all times, we had to make extensive analysis to be sure that any specimen found was not the result of contamination of the mines where we were executing our research. We also measured the age of the water to be sure it was not recent, using both chemical and bacteriological techniques. And we had to maintain aseptic conditions at all times. These are similar to, though milder than, the kinds of precautions that might soon be needed for analysing samples from Mars for evidence of extraterrestrial life. Except for Halicephalobus mephisto, we never did find any completely new species of multicellular organisms in the Beatrix mine. This seemed counterintuitive at first, as we expected that a long process of adaptive selection in the deep subsurface would lead to novel life forms. With the advantage of hindsight, though, it is not so surprising. If you consider any patch of soil anywhere in the world, the nematodes (or any other small invertebrate) living there undergo a daily and seasonal cycle of stress. On bright days, sunshine can dry out the soil; when it rains, puddles might cut off all oxygen; at night, the freezing of water or a bigger animal stepping on that patch adds pressure and disturbs the soil. In summary, animals living in the soil on the surface already experience stress every day. Many of the organisms transported to the deep subsurface would have adapted to extreme conditions long ago, so they would not need a long adaptive selection process to be able to survive. That would account for the paucity of undiscovered deep species. It’s an enigma: how did a salt-dependent surface worm get that deep without meeting deadly fresh water? Even after we got past the surprise of what organisms we found living in the subsurface, we were still caught off-guard by where we found them. During our survey of the Beatrix mine, we discovered nematodes living inside salty stalactites at a depth of about 1.4 km. Moreover, this species of nematode was adapted to living in salty water and could not even survive in fresh water. On the surface, this species had been found years before to live in brackish water conditions. Although the Beatrix mine is situated in a dry salt pan, it is still an enigma how a salt-dependent surface worm managed to get that deep without encountering a deadly layer of fresh water in between. The process of transport to the deep subsurface is not yet understood, and is the subject of much current research. Even in the absence of answers, the broader realisation that complex surface life forms can also survive indefinitely in the deep subsurface is good news for the search for life on planets and moons in our solar system. A similar process of migration could have transported life forms to the deep subsurface long before the surface conditions became inhospitable on Mars, for instance. And our journey into the inner life of the Earth is just beginning. We are interested in determining whether species from the deep subsurface truly are as isolated as they seem, and if the migrations go in both directions. It is possible that some subsurface organisms reappear on the surface via hot springs. Our analyses of hot-spring waters in the Limpopo region as well as the southern and western Cape regions of South Africa did not turn up any evidence of such resurfacing. Nevertheless, this is a provocative issue that we are continuing to investigate because it will tell us how frequently genetic materials are being exchanged between the surface and the deep subsurface. Finally, we recognise that we have probably explored only a tiny fraction of the deep biosphere, and might not yet have encountered its most significant inhabitants. It stands to reason that, if cosmopolitan species from the surface can survive in the deep subsurface, isolated from their surface brethren, then over a long period of time some organisms might have adapted to even more extreme conditions deeper in the subsurface. It could be that the real treasure trove of new and weird life forms still awaits discovery far beneath our feet.